A staple of the exotic pet trade, the so-called “red-tailed boa” is the latest serpentine reptile to inspire a corresponding motif for Kobe Bryant‘s signature Kobe 8 System from Nike. Adopting a scaly University Red/Sail-Noble Red-Pearl Grey color palette across its Engineered Mesh upper, the low-top basketball kicks see additional Pearl Grey applications to the Swoosh branding, midsole, and external heel counter while University takes care of both the thin synthetic tongue and laces. 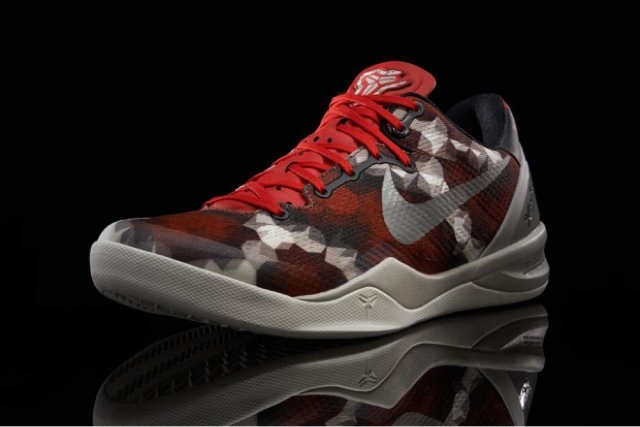 Look for the Black Mamba’s “Red Boa” signature to hit Nike Basketball retailers this Saturday, July 27 for $140 USD.